You may recall that I've had a mild obsession with wingback dining chairs lately. I've been on the hunt for the perfect pair for several months. I've left no stone unturned. One day I stopped by my local consignment store to check on a pair I had been watching and waiting for the price to drop. One of them was sold and the other one was still overpriced. So, I looked around some more and that's when I spotted them. They weren't exactly what I had been envisioning. But I liked them. I liked the price. I liked that they were Ethan Allen. I liked that they were the correct dining height. 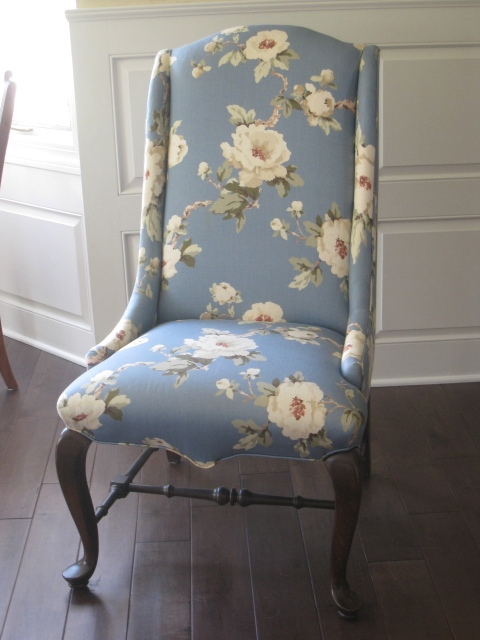 I liked that I could live with the fabric until I figured out how I wanted to reupholster or slipcover them. And, when I finally let go of the idea of the wingback in my mind, I realized the scale of these chairs worked better in my room. So, there you have it. The wingbacks have landed. Now, I just have to find 8 side chairs. That shouldn't be too hard... ha! I actually like the style of these, with less of an arm, than real wingbacks for use as dining chairs. And you're right, the fabric's quite pretty. Carolyn LOVE the chairs and the pretty fabric! You scored big time!! Perfect!!! I love that look and can't wait to see what you end up doing with them! I like the pop of blue actually in your room. I think it is so pretty against the dark woods. Those do look perfect in there! You're so lucky to have such a large dining room to entertain in. Mine is very small. I love wingback chairs at the end of a dining room table. You just have to have a large room for them and you definitely do! Not having the high arms on those chairs will better suit your guests while eating too. These chairs are so beautiful. I too have a obsession with the wing chair, Your dining room is looking really great. Thanks for sharing. These are perfect, Carolyn! I love the pattern...they look SO good at your pretty table! Hi Carolyn - I actually think these work better than the wingbacks - they are lighter and airier and will also be more easy to move around. Gorgeous choice. Your patience paid off my dear. Those are perfect! Love them! I searched for wingbacks too and it's not easy to find them in the right height for dining. These are lovely with their leg details and take up much less space. Good score! Carolyn, Great choice! I love the chairs and they are beautiful in your dining room. I love the style of the chairs...and knowing that they are Ethan Allen, I am so loving them more! !....They look great in the dining room!...they were waiting for you to take them home! Excellent! Time for a dinner party! Unbelievable how pretty the fabric looks in your room! What a find!